WAIST HIGH: Happy 25th Birthday Rebel Yell. Happy 25th Birthday Rebel Yell. The second album by Billy Idol produced four singles, "Rebel Yell," "Eyes Without a Face," "Flesh For Fantasy," and "Catch My Fall." 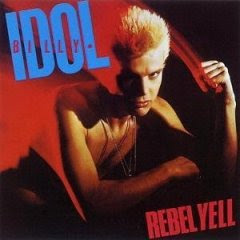 Idol revealed on VH-1 Storytellers in 2001 that the inspiration for Rebel Yell came after an encounter with Ron Wood, Keith Richards, and Mick Jagger. He said that they were drinking something, "I was trying to see as they were drinking it, following it up trying to see what it was called." They told him it was Rebel Yell, a Tennessee Southern Sour Mash. "Wow, Rebel Yell, that's brilliant. Great, because I'm gonna call my next album that and I'm gonna write a song called that. It's brilliant, and I did." The song "Rebel Yell" went to #46 in the US, "Eyes Without a Face" went to #4 and was the first song from the album to break the US Top 10, "Flesh For Fantasy" went to #29, and "Catch My Fall" went to #50.